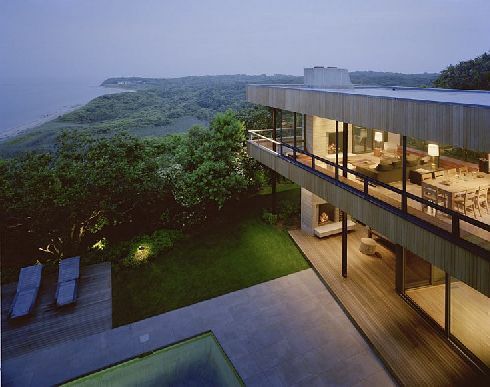 Art and Surf is a beautiful modern residence designed by Steven Harris Architects and located in Montauk, New York. The villa is situated just a few steps away from the ocean and its generous windows allow unobstructed views of the surfers and waves. For sale on Sotheby’s, this home is not expensive, it is outrageously costly: $11,995,000. The residence features four bedrooms, four and a half bathrooms, a 4,585 Sq Ft. / 426 square meters interior, two fireplaces, basement windows with a view into the swimming pool, sliding walls of glass, and stairs down to a private beach. Designed in a charming contemporary style, the interiors are fascinating, some of them displaying minimalist decors with strong aesthetic effects. Modern and elegant inside and out, the Art and Surf House could serve as the perfect permanent getaway.